The Knowledge Solution. Stop Searching, Stand Out and Pay Off. The #1 ALL ENCOMPASSING Guide to F-Commerce. An Important Message for ANYONE who wants to learn about F-Commerce Quickly and Easily... "e;"e;Here's Your Chance To Skip The Struggle and Master F-Commerce, With the Least Amount of Effort, In 2 Days Or Less..."e;"e;Facebook commerce, f-commerce, and f-comm refer to the… buying and selling of goods or services through Facebook, either through Facebook directly or through the Facebook Open Graph. Last year 1.5 million businesses had pages on Facebook that were built using Facebook Markup Language (FBML). This year Facebook deprecated FBML and adopted iframes. Among other things, this allowed developers to gather more information about their Facebook visitors. Get the edge, learn EVERYTHING you need to know about F-Commerce, and ace any discussion, proposal and implementation with the ultimate book - guaranteed to give you the education that you need, faster than you ever dreamed possible!The information in this book can show you how to be an expert in the field of F-Commerce. Are you looking to learn more about F-Commerce? You're about to discover the most spectacular gold mine of F-Commerce materials ever created, this book is a unique collection to help you become a master of F-Commerce. 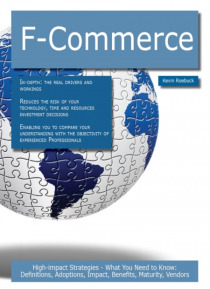 This book is your ultimate resource for F-Commerce. Here you will find the most up-to-date information, analysis, background and everything you need to know. In easy to read chapters, with extensive references and links to get you to know all there is to know about F-Commerce right away. A quick look inside: Social commerce, Facebook, Groupon, LivingSocial, ShopSocially, BuyWithMe, Etsy, StuffBuff, CafePress, Kactoos, Electronic commerce, Social shopping, Social network, Web 2.0, The Cluetrain Manifesto, Enterprise social networking, Followmy.tv, Social networking potential, Assortative mixing, At Home day, Jay Baer, Barabsi-Albert model, Bix.com, Blomap, Bridge (interpersonal), Bring Light, Ronald Stuart Burt, Business and employment co-operative, Business ecosystem, Canal Contemporneo, CAPA-alpha, Chris Heuer, Cisco Eos, City network, Citysocialising, Colalife, Collaboration graph, Collaborative consumption, Collaborative finance, Commonground (social network), Community recognition, Complex contagion, Consequential strangers, Coolspotters, CUNY Academic Commons, Distributed social network, DJ Tutor, EFactor.com, EgoNet, Entrepreneurial network, Erdos number, Erdos-Bacon number, European Women's Management Development, Expatica, Fab (social network), File sharing, First Tuesday (networking forum), Fremont Arts Council, Friend of a friend, Friendship paradox, Galaxy chat, Gender and social capital, Geosocial networking, Giant Global Graph, Gnip, Gnomedex (conference), Keith Hampton, Helping Angels, Hookt, Hub Culture, Information Routing Group, Interlac (APA), Interlock diagram, International Network for Social Network Analysis, ITunes Ping, Jewish geography, Katz centrality, Koofers, Krackhardt E/I Ratio, Ladies who lunch, Lateral communication, Lateral diffusion, Lateral media, Learnhub, Let's Adopt, LinkExpats, Little People of Canada, Lost Zombies, Mahara (software), The Mix Network, Mobikade, Mobile Monday, Mobile social address book, Mobimii, Myzerr, Amber Naslund, Net-Map Toolbox, Nirvino, MOSH, Norwescon, Online learning community, Open Salon, Opie Gets Laid, Organizational network analysis, Penny Arcade Expo, Person-to-person lending, Personal knowledge networking, Personal Network, PicDial, RadCon, List of social network researchers, Rhizome (philosophy)...and Much, Much More!This book explains in-depth the real drivers and workings of F-Commerce. It reduces the risk of your technology, time and resources investment decisions by enabling you to compare your understanding of F-Commerce with the objectivity of experienced professionals - Grab your copy now, while you still can.